Jeff Scott is a teacher within the Shambhala community with a particular interest in how meditation practice can be a crucial tool for working with issues of diversity, bias, and harm. In this article, he responds to questions on this topic from Shambhala Mountain Center (SMC) staff member Travis Newbill, and the resulting dialogue offers insight into the journey of personal and societal healing. Later this spring, the journey continues as Jeff leads Looking Deeply: Meditation & Diversity (May 10–12) at SMC in Colorado. 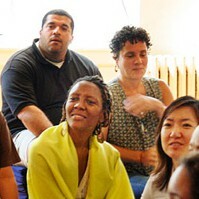 Travis Newbill: Shame and inadequacy seem to be common things people have to work with in meditation, and in community. One way this manifests for me – as a pretty much cis-white-hetero-male – is shame related to my lack of understanding of other people’s experience; in particular, those of less privileged identities/embodiment – and how my own lack of understanding may affect their experience in a negative way. I even feel insecure about how I’ve phrased this question – which isn’t yet a question – afraid it will further reveal my inadequacy, or, worse, offend or trigger someone who reads it; maybe even you. Jeff Scott: I think with meditation and with interpersonal work/community work the only place we can start – and this is not being trite or cliché – is exactly where we are. And it takes incredible bravery to do that – to be vulnerable and honest in the present moment; to be vulnerable and say – possibly for the first time in our life – ‘Hey, I’m here. I am not an expert, and I know some things need to shift, but I don’t know what they are. Or that it’s quite possible that my unknowing has been causing you harm.’ Whether we are talking about our strengths, or areas within us that need to be strengthened, to really show up is quite an amazing and beautiful feat. From there, then, comes the courage to continue the journey – to open, to listen, to pay attention, to hear our own stories and wisdom we have harnessed from our own lives; to journey into our own difference; to practice appreciation and love – to care. How is meditation, and a “start where you are” approach, actually conducive to the work moving forward? How is the process of inner exploration – which is likely to reveal shadow sides – related to interpersonal work and the possibility of healing? We need to increase our capacity to be seen – our own capacity to feel, and really use that body-wisdom to lead us on this journey of authenticity. So, yeah, we swim in our own unknowing, our own bias – knowing full well that this is a place that harm comes from – and yet we journey there so bravely and intentionally. We let our own care for ourselves and the world begin the healing. It’s as if we are afraid of our own inadequacy to have this conversation and therefore also shy away from the possibility of healing – and so – on and off the cushion we must leap into that terrifyingly fresh space. It is terrifying – and confusing. And I keep circling back to the question of whether it’s okay to be this confused and terrified. Like, am I doing something wrong – as a privileged person, still this ignorant? How to reconcile “start where you are” with shame about where you are? Yes, life is all very confusing. Privilege itself is a kind of numbing or loss of curiosity about the intensity we encounter – and so it is only thru a re-injection of curiosity that we can get out of this mess. Shame about where and who you are will just weigh you down on this journey. Where we go from here is just another open question, isn’t it? Certainly there are examples from history and from the headlines that suggest what may happen if, in this challenge, we decide to divide, to build walls, and moats, and defenses. But there are also plenty of examples of what occurs when we lean in, support each other, build bridges. So I don’t know where we’re headed, but I know how I want to get there – I trust others want this too. Jeff Scott is a graduate of Naropa University’s Buddhist Studies program and a long-time student and teacher within the Shambhala community.